Preschoolers (0 to 6 years old) and their parents are invited to come and share a “Taste of Shabbat” at our bi-weekly Tot Shabbat Services. 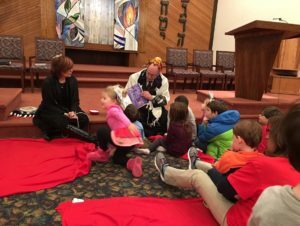 Tot Shabbat is led by Rabbi Paul Sidlofsky and Cantor Marcey Wagner, with assistance by pre school teacher Diane Weitzman. Beginning October 2018, Tot Shabbat will be held at 5:30 once a month. Join us for a child friendly service, singing, story and a craft. Celebrate shabbat with challah, juice and candles. Make new friends! Everyone Welcome!